LEDs are covered by the IEC regulations and special care needs to be taken to ensure that LED based illumination installations will not cause harm to the operator. LED lighting safety procedures are very similar to the laser safety regulations and are based on the intensity, duration and wavelength of the light produced. In accordance with EU machinery mandates, EMC mandates, and low voltage mandates, machines and electronic devices not marked with the CE logo are subject to distribution restrictions within the EU. All LED illumination products and power supplies should conform to corresponding regulations. Since September 2011 the new classification standard EN62471 (see table) has to be applied to LED illumination. In the case of UV and IR LEDs, special precautions should be taken as the human eye does not see these wavelengths and the user cannot see whether an illumination unit is switched on or not. The following guidelines should be observed. Do not look directly at the LEDs while in operation, even for short periods of time. If you are using UV/IR light, wear suitable eye protection. Attach corresponding warning notes to the machine. NOTE: It should be remembered that visible LED devices are perfectly safe under normal viewing conditions. In normal use, standard lighting products from our suppliers will be placed at much greater distances than is used to calculate the MPE tests and typical exposure times will also be much shorter. If you have any further questions on this important subject of LED safety, please do not hesitate to contact our experts. 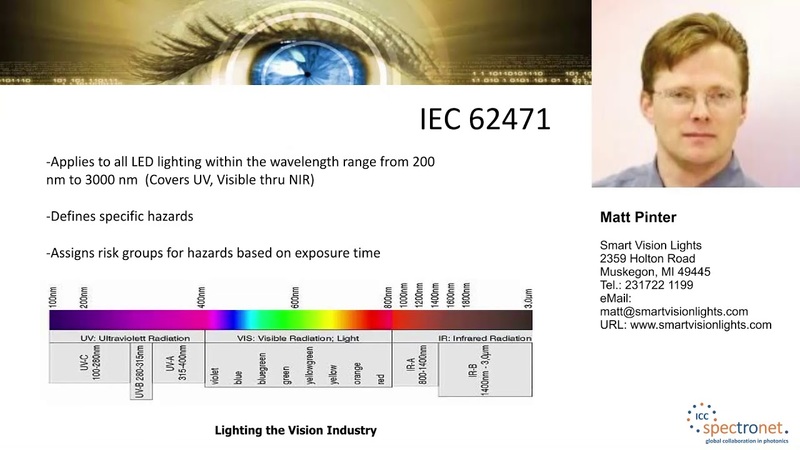 The machine vision technology forum will provide information to help users understand how to test LED lighting products in accordance to IEC 62471. The information presented will explain the IEC 62471 photobiological safety of lamps and lamp systems for LED lighting. A practical approach will be covered regarding the testing and the classification of an LED light into the proper risk group classification. An overview of the testing procedures, equipment and the IEC 62471 report will also be discussed.